Praise be to the gorgeousness that is Lauren Foley- Writer, who has tagged me as a Liebster Award participant! For those of you who don't know what that is, it's kind of like blogging chain mail, except not as annoying, and no one threatens to set ghosts on you at midnight and kill you. Basically, it's a really cool way to get to know the bloggers your favourite bloggers are already reading, and pass on the love. So thanks to Lauren for this lovely New Year suprise! Write 5 random facts about yourself. Answer 5 questions posted by the presenter and ask your nominees 5 questions. 1. I am ridiculously scared of heights. As in, I can manage to be afraid of the second floor of your house. And if your stairs have gaps in them... forgeddaboutit. 2. I like to sing to my dog, Buddy. My favourite song is "Buddy man, Buddy man, does whatever a Buddy can!" to the tune of the Spider Man song, but any song that can have its lyrics adapted to be dog related will do. 3. When I grow up, I would like to be Zooey Deschanel. 4. I have been trying to read Middlemarch since April 29th last year. 5. I used to do Tae Kwon Do and I almost got my black belt. 1. The best book you’ve ever read and why? This is like trying to pick which limb I would least like to lose! (To quote Neil Gaiman.) I have many favourites, but I would have to say Craig Silvey's Jasper Jones, if only because it moved me so much that I spent a year of my life studying and writing about it, as well as because it's an excellent book which interacts with all the Australian mythology that has come before it. 2. Pick an author, you’ve read all their books, rank them. 3. What’s your favourite word in a language other than your 1st language? Someone once told me that Wagelpudden meant Jelly in German. 4. A poem you think should be set to music. Which style? Ashamed to say that I don't really know any poetry! That's one genre I will definitely be getting into this year. I guess TS Eliot's Lovesong of J Alfred Prufrock done like an Enya song would be interesting. 5. If you could be a painting which one would you be and why? It came up a lot in my honours, and the colours are beautiful... even if she probably is lost and about to die of exposure. 1. Who would play you in a movie about your writing career? 2. What is the song you secretly sing to in the shower? 4. Which Hogwarts house would you be in and why? 5. What is your Favourite Place in the whole world? This was fun to read. I had to laugh at your comment about Middlemarch. Our book club had a New Year theme recently (do you know how hard it is to find books with that theme) and a book that came up when I searched was Middlemarch. I went so far as ordering it from another library only to decide to go with another book. I hate gaps in stairs or bridges and I enjoyed all of Kate Morton's books as well. 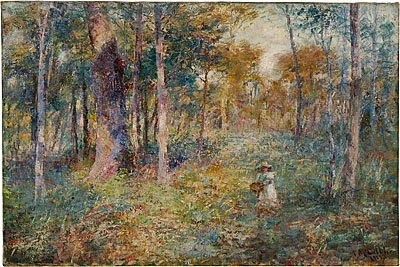 Oh, and Frederick McCubbin was always one of my favourite painters.